Barneys has teamed up with Disney’s animation know-how to create a highly entertaining fantasy film for its Christmas windows. The animated short called Electric Holiday, to be shown at Barneys’ Madison Avenue store in New York, features Minnie Mouse staring longingly at a Lanvin dress, before she is transported to a fashion show with some of the fashion industry’s very real favorite characters. 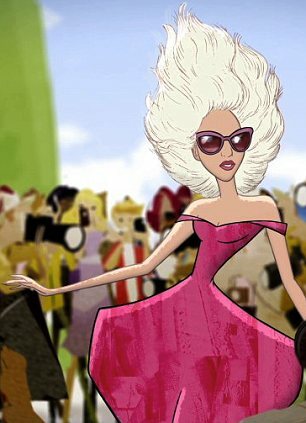 Front-row favorite Sarah Jessica Parker, model Naomi Campbell, music icon Lady Gaga and Vogue‘s Anna Dello Russo are just a few faces that were given Disney’s animated treatment. Balenciaga’s Nicolas Ghesquière, Carine Roitfeld, Cathy Horyn, Bryanboy and Lanvin’s designer Alber Elbaz also agreed to participate. WWD called the concept, which was a year in the making, “kitschy, clever and absolutely adorable”. Mark Lee, Barneys CEO explained: “Disney came up on a very short list of dreams – thinking about if we could do anything, what would we do? Once on board, both teams brainstormed their dream narratives, and a wish list of fashion personalities. All the fashion character participants were asked to sign off on rights to their soon-to-be drawn animated selves, and once they had agreed to be included, all artist interpretation was at the discretion of Disney – no facial features, or waistlines could be redrawn. Few of the participants have seen the finished product, which will be unveiled on Wednesday November 14.